A Coushatta family donated an early 20th-century cotton scale and seeder to the Louisiana Creole Heritage Center at Northwestern State University. The scale weighed cotton at B.O. Jones & Sons, a general store on Ringgold Street in Coushatta that operated from 1919 until the 1980s. Using poises and hooks, this device, which is taller than eight feet, could weigh up to 700-pound cotton bales, according to NSU Professor of Anthropology Dr. Pete Gregory. “A scale like this would have been used in the 1920s and 1930s, although this same type of scale has been around forever,” said Gregory, who is the academic advisor for the center. “An average cotton bale would have been around 500 pounds. 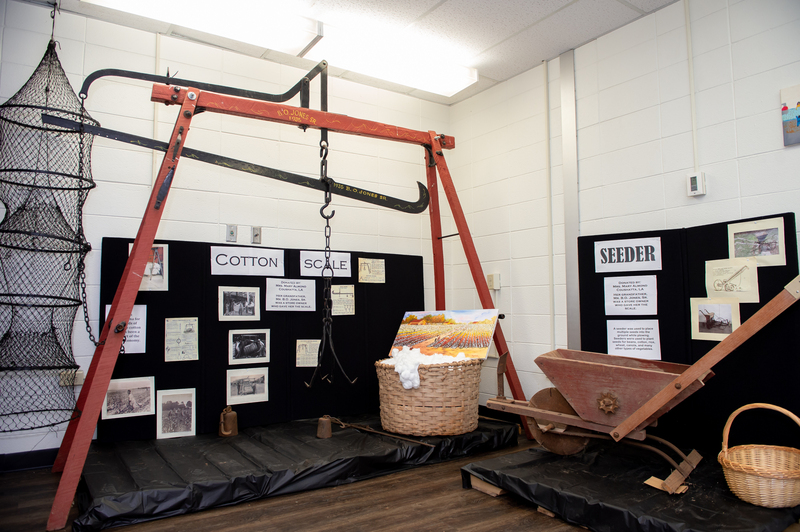 A hand-held cotton seeder accompanies the scale in the exhibit on the first floor of Kyser Hall. A plow is attached to the seeder, making furrows in the field in which a gear mechanism would drop seeds. Cotton was king in the Red River and Mississippi River areas until the 1960s. “Cotton was dominant in the local economy until corn and soybeans took over,” Gregory said. Mary Almond, daughter of Glen and granddaughter of B.O. Jones, said the store served as an economic and social hub of Coushatta. “You could buy everything from farm necessities to groceries, shoes and clothing,” said Almond, who contacted NSU about housing the equipment. “The store would deliver groceries to you as well.